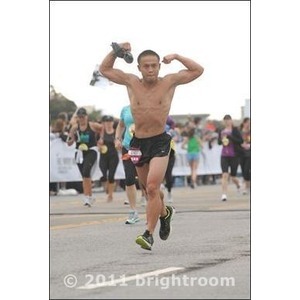 I am the Co-Founder of Green Cormorant Run Club in Oakland, Ca. Running has such a positive impact on my life that I wanted to share the same positive benefits with my community, so my friend (Rich) and I created Green Cormorant Run Club. We are on a mission to help get our community active and healthy, and in return we hope the community will make healthy choices and everything positive will follow. We use running as a platform to get our community active and once a month we host weekend socials. Our weekend socials are fun activities outside of running. We have hosted kickball games, went to trampoline facilities, and done fun runs that end up at a doughnut shop. Please enjoy the benefits of running and getting active with us. Our run club meets every Tuesday at Lake Merritt in Oakland next to the Lake Chalet, Run starts at 6pm. I race to fulfill my need for competition. I have always been an athlete and competitive person. For many of us after high school it is hard to find time to get that competition fix. Running allows me to train and to compete on my own terms. I chose a race and I set my own training schedule. I don't participate in races often. I try to find one or two half/full marathons a year. My greatest accomplishment for running has to be completing the 2012 California International Marathon with only 2 weeks of training. I had a goal of completing the marathon and finishing under sub 4 hours. I bought a bib from an older gentleman who couldn't race due to an injury. After buying the bib I had no idea when the race was until my friend told me it was two weeks from when I bought the bib. Naturally I panicked a little and I tried to rack up as many miles as I can before the race. After realizing it was near impossible to get the mileage and rest I needed to stay injury free I decided to save my legs and prepare my mind for the race. I knew this race was going to be an ultimate test of my mental and physical capacity. On race day it happened to be the worst day of the worst storm in December 2012. It rained up, down, sideways. There was so much rain some water run offs were 4 feet wide and nearly a foot deep in some places. I fought against 10-30 mph winds. I was soaked even before the race started. At the starting line, I told myself that I have two choices: I can Embrace the storm or I can hate it and be miserable. I decided to put a smile on my face and embrace the storm. I ran the race like a little kid and tried to make light of the horrible conditions. I cheered with the amazing spectators, jumped in puddles and kept a smile on my face. After 22 long miles the storm stopped and the sun came out. I crossed the finish line at 3 hours 45 minutes. I smashed my goal and exhausted every bit of myself. I put this race at my top three sports accomplishments. My goal is to spread awareness of the positive benefits of running through my run club and to one day qualify for the Boston Marathon.